Exchanging gifts is a common enough practice today. 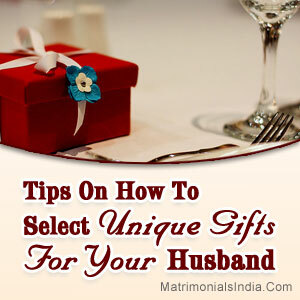 With there being so many occasions to exchange gifts, & there being no dearth of different kinds of gifts in the market, finding a unique gift for your husband can be a daunting task indeed. This blog deals with some unique gifting ideas which you can use to surprise your husband & make it a memorable experience for him. Gifting Idea 1 - Though most men will deny it if you ask, it is true that men also love to be pampered as much as women. So pampering him could be a nice way to share some special moments with the love of your life. Pampering him could involve giving him a massage, or you could indulge him in anything else he likes doing. Gifting Idea 2 - Another great idea would be to plan a short trip which involves just the two of you. If you have kids, pack them off to their grandparents' house, or get a babysitter. If your husband loves camping or trekking this could be a wonderful gift to him. Gifting Idea 3 - Yet another creative gift would be to gift him a subscription of something he loves. If he is a sports freak, it could be the full year subscription of his favorite magazine. Or else, if he loves playing pool you could probably gift him a year-long membership for his favorite club. This way every time he reads the magazine, or is playing pool, he will think of you. Gifting Idea 4 - It is no secret that most guys love to eat; if your hubby too loves eating, then what better idea than cooking him something special. You could try out new recipes (make sure it is something he likes to eat) or you could bake a cake for him, if you have not tried it before. There are a lot of cuisines & dishes out there; all you need to do is find one which you are sure your spouse will like. An awesome gift does not mean that you have to spend truckloads of money; it is simply the thoughtfulness that matters, more than anything.